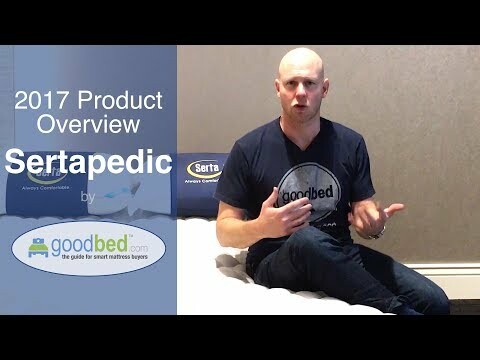 GoodBed's simple explanation of the full range of Sertapedic options for 2017-18, which include all-foam, connected coil, and pocketed coil mattresses. The Sertapedic mattress collection is designed to offer the quality expected from the Serta brand at exceptional values. Sertapedic features the VertiCoil Premier Innerspring, which offers more support and surface coverage than other value-priced innerspring systems. Sertapedic also offers a variety of advanced comfort features including Memory Foam and Serta Latex Foam in select models that give you the comfort and support you need, all at an affordable price. Everyone deserves a great night's sleep. Sertapedic has the features you need to sleep better at an exceptional value. The Sertapedic line is recommended by 75% of owners on GoodBed (based on 305 ratings + 5 reviews). Do you have a Sertapedic mattress? Write a Review! Have a question about Sertapedic bedding products or stores? Mattress Thickness: 4" to 15.50"
Note: The product line specifications above were derived from the active Sertapedic models listed on GoodBed. As a result, these details may not be comprehensive and may not apply to all Sertapedic models. If you are seeking specifications for a particular Sertapedic mattress, please search for that mattress by name on GoodBed, or check with your local Sertapedic dealer. The Sertapedic product line is a collection of mattresses that is manufactured by Serta. Have an update or correction to our information about Sertapedic? If so, please take a moment to suggest an edit. Showing stores with Sertapedic products nearest to Fairfield, CT. Call store first to confirm availability.